Homemade healthy Ice Cream in less than 5 minutes?? Only 3 ingredients and doesn’t require an Ice Cream maker? Low fat and Low cal? Sign me up!! 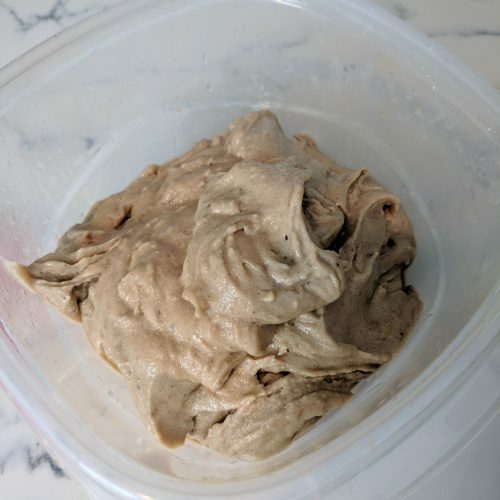 The base of this homemade ice cream is frozen banana! Add a little chocolate protein powder and peanut butter and you have yourself a delicious and refreshing treat! It is gluten-free and vegetarian, so rock on sistah! Who buys bananas on the regular that go brown and get thrown away? Pick me! Pick me! 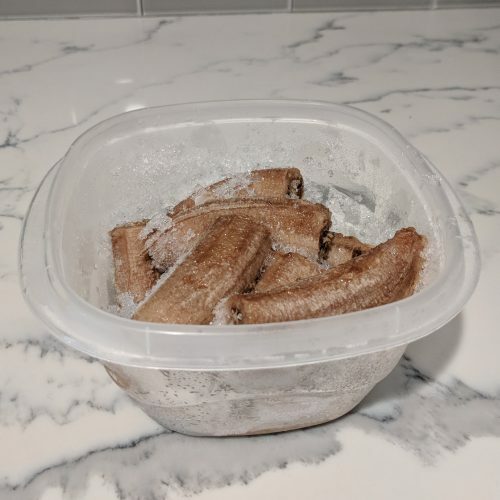 Ok so next time that happens, peel the bananas and throw them in a tupperware and in the freezer. They will be ready for your next batch of ice cream! If they are super frozen, then leave them to thaw on the counter for 10 minutes before starting the recipe. This will make them easier to chop in the food processor (click here for my favorite one). 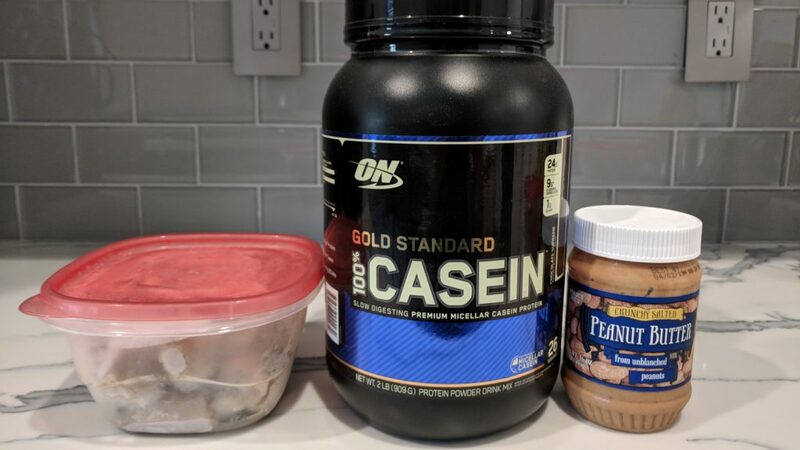 I used Casein Protein (click here to view/buy) but honestly you can use any type and flavor protein. If you are not interested in getting jacked than you can use cocoa powder instead of protein! I buy my cocoa powder from Trader Joe’s but I’m sure you will find it at any local supermarket. 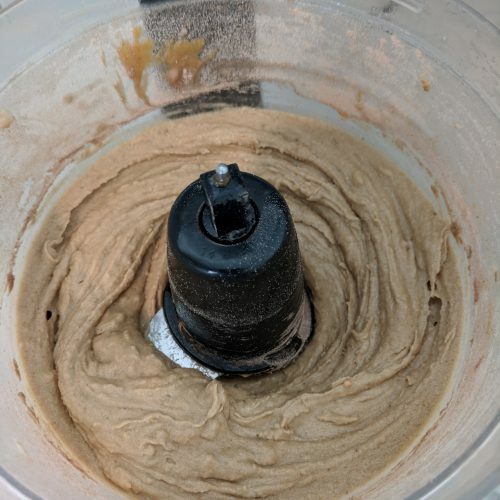 I used Trader Joe’s natural peanut butter but again you can use your favorite natural peanut butter or almond butter. The key is to use non-processed peanut/almond butter that only contains nuts and maybe salt. I have not actually tried Halo Top ice cream (I know I need to) and was very curious about the stats compared to my recipe. To compare apples to apples, we’ll look at the stats for a 1/2 cup serving. Per 1/2 cup serving of my ice cream there are 45 calories, 8g carbs, <1g fat, 2g protein. Per 1/2 cup of Halo Top ice cream there are 80 calories, 13g carbs, 2g fat and 5g protein. So overall those stats are not bad but as you can see my ice cream has half the calories, fat and carbs than the store bought brand. Halo Top sells their ice cream in pints which equals 2 full cups. My recipe makes about 5 cups. As noted above, my recipe has half the calories, fat and carbs of Halo Top, so that means you can eat double of my ice cream (because, c’mon, who just eats a 1/2 cup?!)! I usually split this recipe into 4 servings so that gives you over a cup of ice cream to devour!! My family LOVES ice cream. My grandmother was well into her 80’s and still ate a mug of coffee ice cream every night before bed. That is, and always has been my dessert of choice. I will go to my grave eating ice cream! However, because I love ice cream that much I have to be honest and tell you that while this ice cream is delicious, it is healthy and will never compare to real, full fat, high carb and high calories ice cream from an ice cream shop. It won’t be winning any awards but it will keep you happy and healthy for years to come. 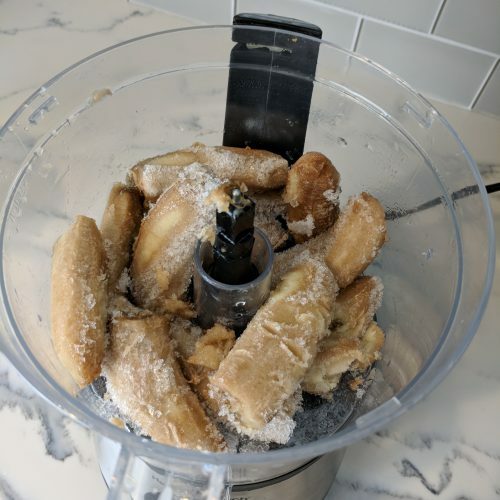 plug in food processor and leave frozen bananas on the counter to thaw for about 10 minutes. add bananas to food processor and blend until fairly smooth, about 30-60 seconds. 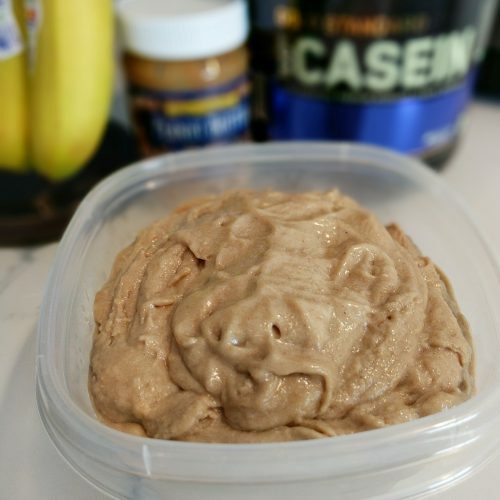 add peanut/almond butter and protein to banana mixture. Blend until they are mixed in and the ice cream is creamy. 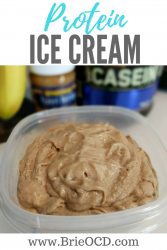 Enjoy OR put ice cream in a tupperware and in the freezer for later! This is my favorite ice cream!!! Woot woot I buy bananas especially for this. yessss, so good! and waaaaaay healthier than store bought kinds! This is my favorite ice cream. I buy bananas especially for this. I definitely need to try adding the iced coffee!! great tip!